Agincourt600 – Commemorating 600 years since the Battle of Agincourt » Can we follow Henry’s route today? Can we follow Henry’s route today? The short answer is yes we can. Beyond Harfleur some places on Henry’s itinerary have grown in importance, while others are now little more than names on the map. Nevertheless, much of the countryside remains relatively sparsley populated, and it is easy to visualise the country as it would have been seen by the men in Henry’s army, with villages marked by their churches visible from long distances across the open countryside. Along the route many buildings, including vestiges of town defences, castles and churches survive from the period. An example of a town with substantial elements of surviving town defences is Montivilliers, only 5km north of Harfleur. Perhaps the finest example of surviving military architecture is the magnificent castle of Arques-la-Bataille. 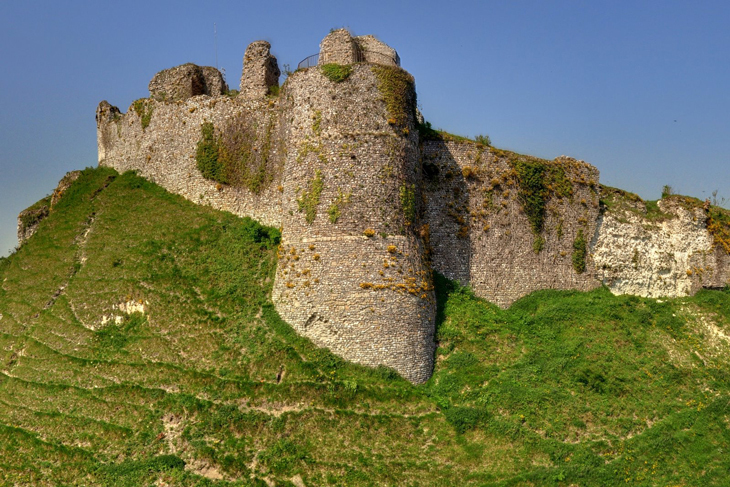 Henry drew up his army in view of this castle and the garrison responded by firing guns. However, Henry did not wish to squander resources and time assaulting such fortresses, and Henry negotiated a safe passage and victuals in return for sparing the adjacent town and the surrounding area from burning and looting. A fine example of the rich ecclesiastic heritage along the route is the priory church of Notre-Dame built in 1130 in Airaines, through which Henry passed in his search for a crossing of the Somme. The route from modern Le Havre to Calais via the battlefield covers a little over 500km, a comfortable tour of a few days by car, a week or so by bike or around four weeks on foot. Of course, there is no need to follow the whole route to gain a flavour of the campaign itinerary. However, retracing even part of the itinerary of Henry’s army, particularly on foot, is a useful aid to understanding the challenges faced by Henry and his commanders in moving a large army, encumbered by wagons and with many men on foot, across northern France on roads of poor quality with the search for food a constant challenge. In particular, the approach on foot from the valley of the Ternoise up onto the higher ground near Maisoncelle and Agincourt as the area of the battlefield comes into view is striking. One can almost feel how many of the men in Henry’s army would have, perhaps for the first time, now been aware of the challenge awaiting them as the larger French army gathered ahead of them, blocking the road to Calais. Discussion of Henry’s itinerary can be found in Agincourt, a New History, by Anne Curry, (Stroud, 2005), paperback edition 2006. The sources of the itinerary are in The Battle of Agincourt, Sources and Interpretations, Anne Curry, 2nd Edn (Woodbridge, 2009). Detailed information for tourist’s wishing to follow the itinerary of Henry V in 1415 can be found in Agincourt 1415: A Tourist’s Guide to the Campaign (See below). Peter Hoskins is, with Anne Curry, the author of Agincourt 1415: A Tourist’s Guide to the Campaign (Pen & Sword 2015), http://www.pen-and-sword.co.uk/Agincourt-1415-Paperback/p/7902. The map was drawn by Scott Hall, ©Peter Hoskins. Photographs ©Peter Hoskins. Did a Dog Fight at Agincourt?